When a new arrival comes to a family it is both common and understandable that the parents, and other close members of family, would wish to make some financial provision for its future. However, many people are confused by the range of products on offer, and concerned that they may not choose the most secure option. 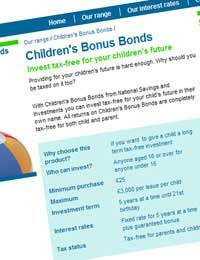 Children’s Bonus Bonds are as secure an example of such a product as can currently be found. Children’s Bonus Bonds are issued by National Savings & Investments (NS&I). When you buy a bond from NS&I you are lending the government a sum of money. In return, the Exchequer provides a guarantee that your loan will be repaid, either on the date of the bond’s maturity or a date of your choice, depending on the terms of your loan. The security offered by the Exchequer makes products from NS&I exceptionally safe. In the case of Children’s Bonus Bonds, the purchaser invests in individual ’issues’. Bonds are issued on a regular basis, currently around four times per year. Each of these issues bears a different interest rate, although the rates tend not to differ too enormously. Investors purchase bonds from an unlimited number of issues, but there is a maximum investment of £3,000 per issue. However, with four issues per year, this means that it is possible for the investor to put away a maximum of £12,000 every year. At the other end of the spectrum, Children’s Bonus Bonds represent an affordable opportunity for those who wish to invest smaller sums; the minimum purchase is only £25, meaning that these bonds are accessible to virtually everybody. Children’s Bonus Bonds reach maturity on the 21st birthday of the individual for whom the bonds were bought. Before this date, the bonds also accrue a bonus every five years, encouraging the child to hold onto the bonds for longer. If access to cash is needed, however, the bonds can be redeemed at any point during their term. Until the 16th birthday of the child, the bonds are under the control of their parent or guardian, even if the bonds were bought by someone else. However, from the date of purchase the bonds are the legal property of the child, and after their 16th birthday their control passes to the owner. One of the most attractive characteristics of Children’s Bonus Bonds is their tax-free status. Regardless of whether or not the bond owner becomes a taxpayer during the term of the bond, any money invested in a Children’s Bonus Bond will be exempt from income tax and Capital Gains Tax. This is in contrast to money given directly to a child to invest on their own, which is taxable if it totals more than £100 in any given year. A sizeable proportion of those who buy bonds are grandparents. If you are a grandparent and are looking for a way to safely invest for your grandchild, you should also bear in mind the fact that, as Children’s Bonus Bonds are the legal property of the child for whom they are bought, this investment also helps to divert assets away from your estate. This doubles the tax-efficiency of the investment, as it may also lower your inheritance tax liability. I was bought a £25 Children's Bonus Bond as a christening present in 2001 and was wondering how much it is worth now and when it matures.